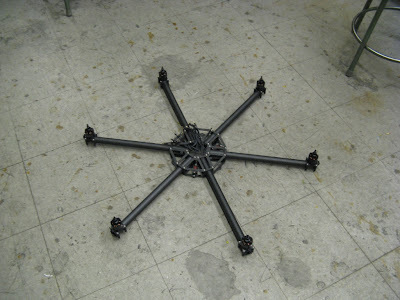 Yes, I am making another post about quadrotors. A made a few minor tweaks to the control of 4pcb. The most notable is a change to the output command for each motor, after all the P[I]D controller and motor mapping. The commands are now sent through a square root function. The force produced by the props is more related to rotational speed squared than to rotational speed. The speed is roughly proportional to the command. So, to produce a corrective a force, as the PID controller would like to do, the command generated in response to angle or rate error should follow a square root-type curve. Or so the story goes. After implementing the remap, I noticed a significant improvement in the performance. For one, some of the high-frequency oscillation is gone. It doesn't seem to wiggle back and forth quickly when it's just hovering. It's also easier to hold it at a given altitude, probably due to the more linear stick-to-force relationship. I don't think it's just placebo effect, but who knows? I can keep it in the air indefinitely in a small room, as long as the battery is above 7.4V. Below 7.4V, the roll axis still gets soft and it's hard to not crash into things. 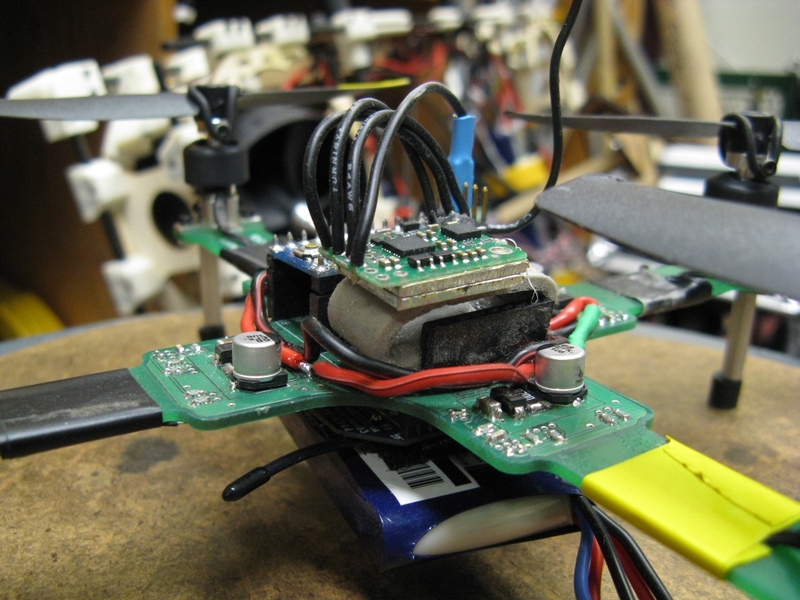 So for now I live with flying just a bit more than half the battery capacity. Even Charles can kinda fly it now. So it must be a little more stable. The two hardest parts about flying it are maintaining altitude and remembering which way it's pointed. While I think you can learn to deal with both of these, I would like it to be easy enough for anyone to pick up and fly. I have, waiting to be installed, a sonar module that can be used for closed-loop altitude control. Then, the stick would control a climb rate or descent rate, but with no input it would hold altitude and you can focus on flying the rotational axes. I also have yet to implement the magnetometer on the new IMU, which can be useful for holding heading so you don't have to deal with yaw. I'm still tweaking the sensorless routine for Pneu Scooter. The software framework for sensorless sinusoidal commutation and field-oriented current control is set, and now I am playing with the different parameters to see if they have the effects I think they should. First, I hypothesized in the last post that the positive relationship between current and flux estimator offset (with respect to the Hall effect sensors), seen here, was due to underestimated inductance. At high current, the rotor electrical angle predicted by the flux estimator would lead the angle interpolated from the Hall effect sensors, which I trust to be more accurate. Based on this figure, if the inductance parameter is too low, the [-IL] vector will be too short and the estimated flux vector will lead the actual flux vector at high current. The effect is exactly what I thought it would be, flattening out the slope so that the offset is constant (near zero) though the entire range of load currents. I may have even gone a bit too far, creating a very slightly negative slope. But now I know that the inductance parameter has as predictable effect. 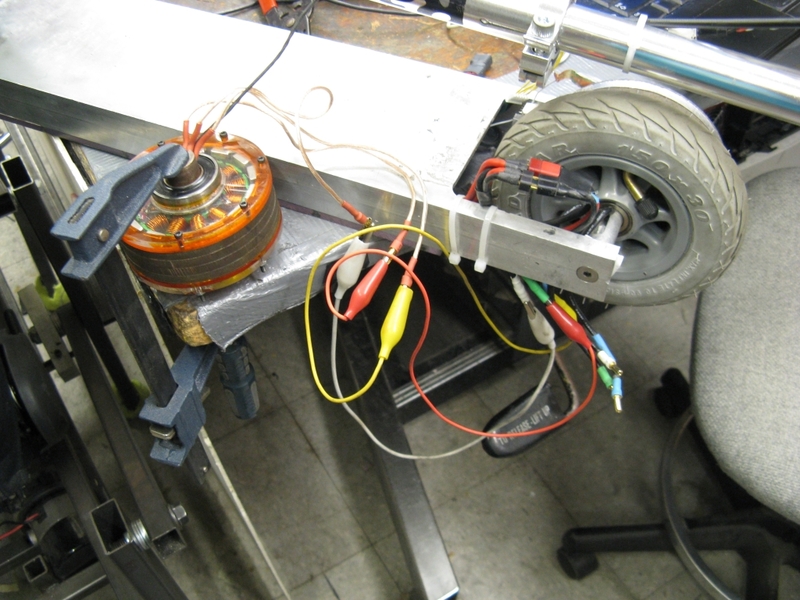 The lead induced by using an inductance parameter that was 33% too low was about 20º electrical at maximum current. The error sensitivity is easy to predict using the vectors in this figure, but I will spare you the analysis in this post. A closed-loop flux observer, which some day in the future I will certainly try out, would seek to minimize the effect of an over- or under-estimated inductance parameter. The ultimate goal would be plug-and-play sensorless that adapts to any motor on the fly. But for now, I can live with nicely-behaved dependencies like this. Though, without the parallel-processed Hall effect sensor data, I would be lost as to how to characterize any of it. And in fact it is, by a small amount. It's also interesting to see that the general form of the flux estimates is very similar for both motors. In particular, the gap between about 200º and 210º shows up in both cases. This eliminates the possibility that the gap is caused by some asymmetry in one motor's winding. It could be current sensor asymmetry, though. Kitmotter also accidentally allowed me to test the fast overcurrent shutdown. 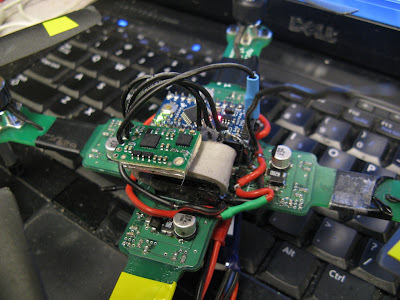 The dangling mess of alligator clips seen above was not the best idea, and when two of the phase outputs shorted to each other, causing a large spark, the controller shut down properly and gave an overcurrent fault. No dead FET. Below 200rpm, the flux estimator angle is greater than the Hall effect sensor angle (trusted to be the true electrical angle). This causes the data, which should lie on the x = y plane, to slope off to the left at low speeds. Making the low-pass filter time constant longer should flatten out the plane and improve the low-speed torque. A lower "valid data" speed for switching to sensorless control will make start-up ramping, when I get around to that, just a bit easier. I'm also worried about high-speed operation, which was the problem that magically disappeared when I made several code improvements. But, I'm still working with relatively slow motors, having commutation frequencies of 200Hz or less. I'm interested to see how things change (probably for the worse) when I try to run a non-direct-drive (indirect-drive?) motor like that of tinyKart, which can hit 750Hz or more. FOC seeks to keep stator current, I, in phase with back EMF, E, which is equivalent to saying that it keeps stator flux 90º ahead of rotor flux. This produces the most torque per amp. To keep the current and back EMF in phase, the voltage, V, is phase-advanced by the controller to counteract the effect of inductance. All these quantities are treated as vectors (really, the magnitude and relative phase of a set of balanced three-phase sine waves). The coordinate system is aligned with the rotor's magnetic field (hence, "field-oriented") and the axis on which the rotor flux is at a maximum is called the Direct (D) Axis. The Quadrature (Q) Axis leads the D-Axis by 90º electrical in the direction of rotation. Which brings up another good point: Unlike back EMF, flux does not vary with speed, so the flux estimator should produce a constant magnitude at any speed. As the V and E vectors increase in magnitude, the scaling by ω keeps the integral-form from growing. The figure above is actually somewhat misleading. For one, the flux estimator doesn't run in the rotating D/Q coordinate system, but rather in the stationary frame, on each of the three phases independently. Also, the estimated flux on each phase is a scalar quantity; it's just the magnitude of the rotor flux seen by that particular motor phase at that particular instant. To derive position from this, I take an unusual approach of watching for flux zero-crossings (with hysteresis) and feeding these transitions to the same interpolation routine that my Hall effect sensors would have gone to. 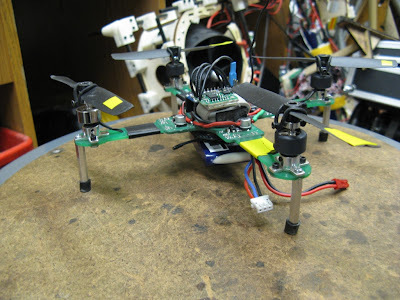 All of the the data in this post was recorded during a five-minute outdoor test drive with the sensorless position estimate running the field-oriented control. The top plot above shows effective regulation of Q-Axis current to follow the throttle command, and the D-Axis current being held close to zero. The bottom plot shows the speed estimates produced by both the Hall effect sensors and the flux estimator. (Both calculate speed by measuring the time for one full period of rotor flux.) They are nearly identical at all speeds, including below 100rpm. The ideal case would be a straight line with a slope of one, indicating perfect agreement between the flux estimator and the Hall effect sensors. There is a good deal of noise in the position estimate, but the general 1:1 correlation is there. The flux estimator angle leads the Hall effect sensor angle slightly, shifting the entire line upwards by about 15º. This is not necessarily the fault of the flux estimator; it could be interpreted as the Hall effect sensors being about 15º behind neutral timing. At any speed, the band of uncertainty in the position estimate is still about 30º. Therefore, there must be factors other than speed which cause offset in the position estimate. The bulk shift of 15º (flux estimator leading Hall effect sensors) is clear in this plot too. At the corner frequency I chose for the low-pass filter, 0.053s, the low-pass filter causes the flux estimator to lead significantly at low speeds. The blue line in the offset vs. speed plot above is the theoretical lead induced by the low-pass filter. Setting the filter time constant to be longer would push the speed at which lead becomes significant down lower. Since the data seems to clearly show this effect, I would like to run some tests where all I change is the low-pass filter time constant. Obviously a longer time constant would be better for low speed operation. Integral drift might hurt the performance overall, though. Here, another clear trend was revealed: the flux estimator lead increases with current. My hypothesis on this one is that the inductance estimate is low. In the first graphic of this post, the -IL vector would be too short if L were underestimated. This would cause the estimated flux to be somewhere in the upper-right quadrant, leading the true flux, which is on the D-Axis. Again, since the data shows a very clear trend, I would like to run some test where I vary only the inductance parameter to see if I can flatten out this line. This particular dependency (position error as a function of load) is one that I think can be avoided as I pursue more advanced sensorless algorithms. A "closed-loop" flux observer would be able to more readily handle misidentified motor parameters by using feedback to adapt the motor model or negate some of the effects of the misidentified parameter. Another valid option is to have the motor parameters self-calibrate, either at power-on or dynamically as it runs. The three phase currents are also plotted and are bounded by nice 40A sine waves, representing maximum positive throttle. Phase A's current (yellow) leads Phase A's flux (white) by about 90º, as it should if the field-oriented control is doing its job.There's a very interesting gap in the flux estimate angle just before 210º, which is also seen as a "staircase" effect in the flux estimator angle vs. Hall effect sensor angle plot. I still haven't tracked this one down or formed a theory about it yet, but this convinces me that it's an issue inherent to the flux estimate, since this plot has nothing to do with the Hall effect sensors. Altogether, this "simple" sensorless routine has been working very well since I modified the controller timing. I can't say I understand exactly why (or even if) the changes I made to the loop timing caused it to start working, but I'm happy that it's now producing useful data and that I have new tests to try out. I'm even more happy that my Pneu Scooter riding ban can be lifted since it's now capable of propelling itself in 100% sensorless mode. After just about one month, my voluntary moratorium on Pneu Scooter riding is officially over. Yes, that means it is now Sensorless Pneu Scooter. 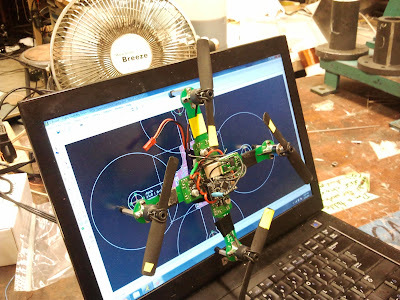 Even though I was distracted by flying things for a short period of time, I have made steady progress on working out the software kinks to get my first attempt at a sensorless field-oriented control strategy up and running. This is a two-week update, so I think I'll have to split it into two parts. The first part here explains most of the code tweaking I did. The second part, to come shortly, is when the sensorless control finally begins to work the way it should. How the two parts are related to each other, I don't exactly know. Part 1: Where I make my code much fancier. In a previous FET failure, the trace leading into the DC bus had blown, so I reinforced it with some copper braid. This moved the weakest link to the current sensor, I guess. It's worth noting that there is a 40A slow fuse in the system but it seems never to actually do anything during failures. Maybe time to go back to the magnetically-tripped circuit breaker switch. In any case, this board is toast. Even after I repair the power stage, it will only work with the DC current sensor bypassed completely. Possible motivation to design 3ph v4.0. I switched to my back-up 3ph v3.1 controller and took some time to implement a few software improvements, including fast over-current shutdown designed to (possibly) save the FETs if (when) the sensorless control commutation glitches. I also implemented a better ADC sampling strategy to try to clean up the current measurements as much as possible. The goal was to sample phase currents at a time where no power switching is happening, since the switching transients can couple noise onto the current sensor signals. This scope plot also shows the motivation for sampling the phase currents away from the transitions. The tiny bits of ringing at each switching event show up everywhere: on other voltage outputs and on the digital line being used to illustrate processor timing. So, by leaving a window where all three PWMs are off and sampling the phase currents exactly in that window, the noise is hopefully reduced. The width of this "all-off" window has to be just a bit wider than the ADC sample time of 1.7μs, so perhaps 2μs. 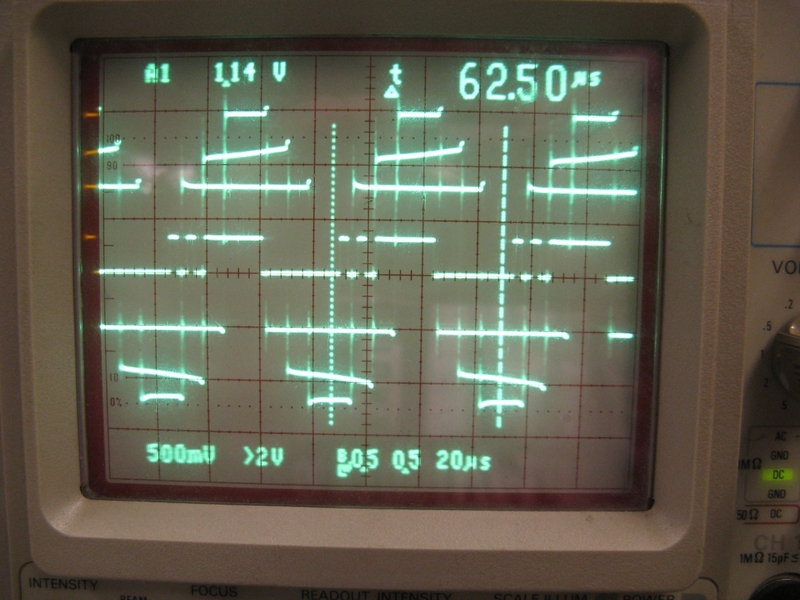 That limits the maximum duty cycle at 15.625kHz to 2μs/64μs, about 96.8%. Since the gate drivers are bootstrapped anyway and need some off-time to work at all, this seems like a reasonable limit. 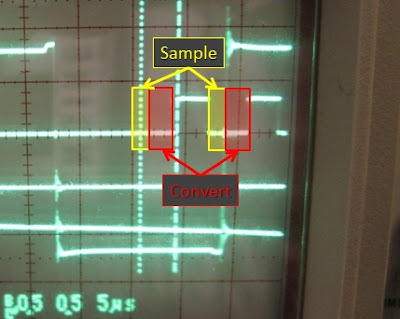 After the three sets of ADC conversions, the fast loop is triggered and runs the sensorless field-oriented control routine using the freshly-converted current measurements. I also added some fast over-current shutdown code to kill the gate drive if any of the phase currents or the DC current exceed a maximum limit, positive or negative. Hopefully the combination of cleaner current measurments and shutdown within 64μs of an overcurrent fault will have some chance of saving the FETs if there is a controller glitch. There are still some minor tweaks I want to make to the code. One way to save a ton of time is to use the Direct Memory Access (DMA) peripheral to automatically store ADC results in memory. Theoretically, this would cut the entire ADC block down to about 10μs. I'm also still running at only 32MHz. I don't need it yet, but the processor is capable of 72MHz in case I want to add more fanciness to my fast loop. But for now, this setup seems fine. After loading the new version of the controller, Sensorless Pneu Scooter magically started working the way it should. I didn't think I had changed anything fundamental, but the performance is much better than it was before, almost indistinguishable from the previously-sensored Pneu Scooter. I've been riding it around for a few days now with no problems. From top to bottom, the graphs represent digital low-pass filters (built into the gyro) with cutoff frequencies of 50Hz, 25Hz, and 12.5Hz. The left plots are the rate signals when the quadrotor is held level and the motors are run at full throttle. The right plots are the angle computed by the complementary filter. Noise in the rate signal can cause trouble in two ways: (1) directly, by being amplified through the derivative (D) term in the control loop, and (2) indirectly, by causing random drift in the angle calculated by the complementary filter. I actually think the second problem is the bigger one, since the angle drift occurs on a long enough time scale that it doesn't get averaged out by the mechanical system. I noticed while flying that the quadrotor would drift a lot and sometimes quickly dart off in one direction, something that could be caused by the sharp jump in angle seen in the right-middle graph. It doesn't drift as much and the random darting is significantly reduced, at least to the point where it can be controlled. It still lacks altitude control, so maintaining height is difficult. But the improvement just by tweaking the filters is pretty neat. The most important change from the original schematic is that the Sparkfun IMU, which has been discontinued, is not used. Instead, the Pololu minIMU-9 is externally wired into SDA, SCL, +5V and GND. Since the IMU needs to be creatively mounted on a ball of foam tape anyway, I did not include it in the board schematic. 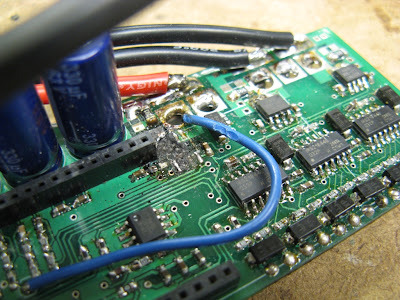 The power wiring to the motor control chips is also done externally, connecting to the pads near each chip. In a future version of the board I may clean all this up. It's a Pololu MinIMU-9, featuring an ST L3G4200D 3-axis gyro and LSM303DLM 3-axis accelerometer and magnetometer. This replaces the now-discontinued Sparkfun 6DOF Razor IMU, which had six analog channels (3-axis gyro and 3-axis accelerometer). So, instead of reading each axis into the Arduino Mini's 10-bit ADC, the digital IMU streams 12-bit readings over a 2-wire serial interface (I2C). The digital IMU has other nice features as well, such as programmable gains, sampling rates, and low-pass filters. No more fidgeting with RC filters on the board. It's compatible with the Arduino Two-Wire Interface (TWI/I2C) library and the sample code on the Pololu page is easy to work with. For once, I must admit that the Arduino I2C stuff does in fact make life easier. Even the wires connecting the IMU to the main board need to be very flexible high-strand-count wire so as not to transmit vibrations. I should really film it in high speed and be horrified at the amount of high-frequency flexing happening in the frame. It would also be very easy to add stiffeners, though I would have to think about how much I want to compromise on the "entirely made out of a single PCB" goal. Well, no, the next obvious step would have been to run it under load with the Hall effect sensors but collect data from the flux observer in parallel to ensure that it is working. But I guess I skipped over that step. In order to do this on 3ph v3.1, I will need to mess with the timers a bit. Each of the three phases of PWM are controlled by different timers (for very good reasons, I assure you). So before I can have them trigger the ADC, I will need to synchronize them and change the PWMs to be center-timed, all things the 1072-page STM32F103 reference manual ensures me are possible. Memory Access (DMA) to fully automate the ADC and save processor time. Faster fast loop. I don't want the fast loop and the ADC sampling to run into each other, so I will put the entire fast loop at PWM frequency, as it was on 3ph v2.1. 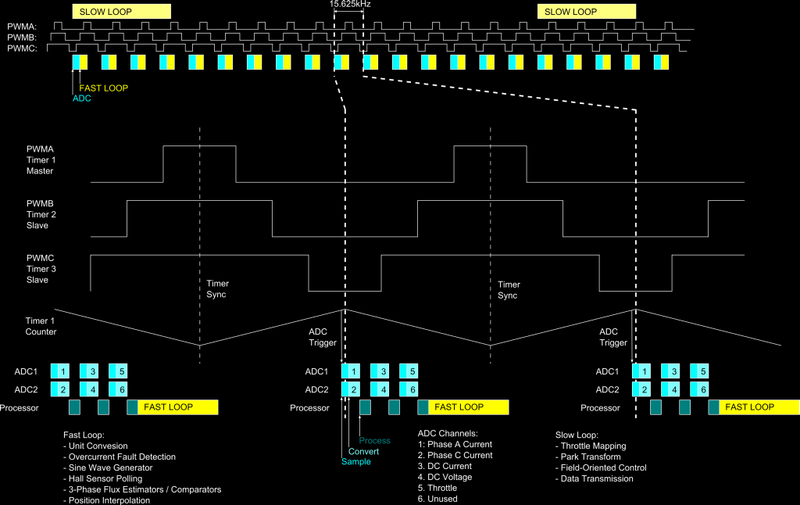 The timer interrupt will trigger the ADC, then the End-of-Conversion interrupt will trigger the fast loop. Fast-loop current fault protection. If any phase current measurement exceeds some threshold, it will trigger gate driver shutdown in the fast loop, within 64μs. This might help protect the MOSFETs from destruction in the (likely/certain) event of commutation failure. More data. I would like to transmit some of the intermediate variables in the flux estimator so I can maybe see more clearly why it fails at high speed. Hopefully with all these changes, testing will go more smoothly this week.